Featuring physical number buttons, a tiny monochrome screen and a durable bulbous design was not able to stop the iconic Nokia 3310 from breaking sales record in 2000’s era. With 126 million units sold worldwide, it’s one of the most successful phones ever made. The record breaking phone is expected to make its comeback and will feature the same indestructible body, long lasting battery and the same software comprising the same clock, calculator, reminder app and games (Snake II, Pairs II, Space Impact and Bantumi) as were available in the initial model. The Finnish manufacturer of Nokia, HMD Global will relaunch the mobile phone at Mobile World Conference (MWC) 2017. 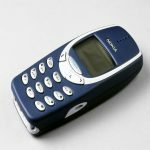 A very important question arises with this news that in the present day smartphone world if Nokia 3310 makes a comeback then who is going to buy it? In the markets like India, feature phones still sell more than the smartphones because it is a preferred device for many and moreover the smartphone prices have not come down and so HMD global is going to target emerging markets like India, Brazil, and many Sub-Saharan African countries. Further, this phone is of interest to people who want to have a second handset. Nokia 3310 was originally released in 2000 and has been subject of internet memes on various social networking platforms.